VATICAN CITY (AP) — Declaring that “today is a time of mercy,” Pope Francis on Sunday closed a historic meeting of bishops that approved an important new direction in welcoming divorced and civilly remarried Catholics into the church. The synod’s endorsement, by a single vote, of Francis’ call for a more merciful, less judgmental church was a clear victory for Francis and the progressive prelates who have been seeking wiggle room in church teaching to allow remarried Catholics to receive Communion. Conservatives had objected, citing church doctrine, but they couldn’t muster the votes needed to block passage of the final document. With the badly divided church hierarchy before him in St. Peter’s Basilica, Francis took veiled aim Sunday at those in the church who place more importance on doctrine and law than on God’s mercy and forgiveness. He warned them of the risk of “becoming habitually unmoved by grace,” of turning a cold shoulder to God’s most wounded children and of a “spiritual illusion” that doesn’t let them see the reality of their flock and respond to it. 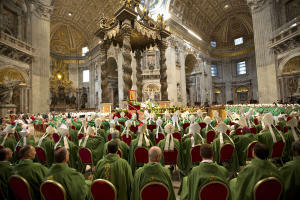 Without changing church doctrine, the 275 synod “fathers” on Saturday approved a 94-point final document on responding better to the needs of today’s Catholic families. The text covered a host of issues — migration, poverty, single parents and polygamy — but the most disputed section concerned whether civilly remarried Catholics can receive Communion. Church teaching holds that without an annulment, these Catholics are essentially committing adultury and cannot receive Communion. While the document doesn’t chart a specific path to receiving the sacraments as originally sought by liberal prelates — and doesn’t even mention the word Communion — it opens the door to case-by-case exceptions by citing the role of discernment and individual conscience in spiritual direction. The key paragraph says a case-by-case approach is necessary when dealing with remarriage since not everyone bears the same responsibility for the failure of the first marriage. It passed with only one vote more than the two-thirds majority necessary. Its passage will give Francis the room to maneuver if he wants to push the issue further in a future document of his own. German Cardinal Reinhard Marx, who spearheaded the German theological initiative that was decisive to getting the majority, said he hoped that Francis would issue it during his upcoming Jubilee Year of Mercy, which starts Dec. 8. British Cardinal Vincent Nichols said the synod marked a “decisive” moment for the church in reasserting the role that pastoral practice, more than doctrine, must play in accompanying the faithful.